Inspired by the amazing Louise, I've decided to start this new series of posts that will come out every Sunday (I know, it's Tuesday, but let's pretend I wasn't late with this one). It will enable me to share with you my day-to-day life, as well as aspirations, progress (fitness, food and photography) and maybe some of my daily outfits. 1. 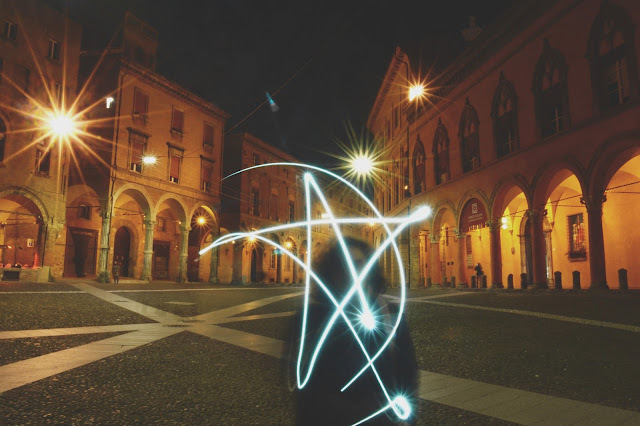 I went to take pictures in my city (Bologna) with my friend Ludovica (the unrecognizable shadow behind the fluorescent star); the picture you can see above is one of the products of our photography session. I've truly been enjoying taking pictures lately, especially experimenting with moving lights and shutter speed. Even though my favorite subject is people, the slightly warmer weather has allowed me to spend more time outside, perfecting my ability of portraying this gorgeous city at all times. 2. Saturday was also the birthday of one of my best friends, Giorgia. We went to a bar with our friends and had an aperitivo, (kind of a later happy hour, where people have drinks and can eat all that they want). 3. Days have been amazing lately - weather wise. Spring really seems to be around the corner: the days have been longer and we have been blessed with an amazing, warm sun and gorgeous sunsets. What better weather to go on a walk? My beloved mom and I have been going on long walks lately, and there couldn't really be anything better phisically, mentally and spiritually. We have been tracking our walks with two apps: "Walking" and "MapMyRun", which allow you to check the distance you have walked, how many calories you have burnt, and all that jazz. "Argus" also counts your steps. The best aspect of these walks though? The sunset. 4. I have just finished a book which I have been obsessed with - Zeno's Conscience by Italo Svevo. This is the classic decadent novel, not only unique but also inimitable. You will get to know the character of Zeno in such an intimate, personal way that - even though his behavior is questionable as well as his values - you will get affected by him and really close to him. It's not a long read, neither a very linguistically hard one, however it is a novel that makes you think about the way you participate in your own life. Must read. I hope you enjoyed this short, personal post. Please let me know in the comments how you feel about this new series and whether you would like to see what I eat in a day, my outfits, maybe if I reorganize my desk and such, the way I do it. I love these types of posts! And wow, that sunset is gorgeous. Thank you! I know right? I just love going on long walks to admire the beauty that surrounds me every day - which I don't really get to notice very often, since I'm always in a rush. You have such amazing pictures! I love your photography experiment with light! It sounds like you have bee having a busy and positive week! Never heard of Zeno's Conscience, but it looks and sounds very intriguing. The weather does really look incredible in your photo as well. Sunset is always so inspiring. My life often offers me plenty of experiences to make, which I sometimes complain about, but honestly are a huge mood booster and make life worth documenting. Sunset has to be my favorite time of the day (besides waking up on Sundays in summer when the sun's already out and birds are singing), so soothing.